The photograph was posted to Chinese social platform Coolapk.com by relatively unheard of leaker Chnlyk, which doesn’t do much for its credibility. 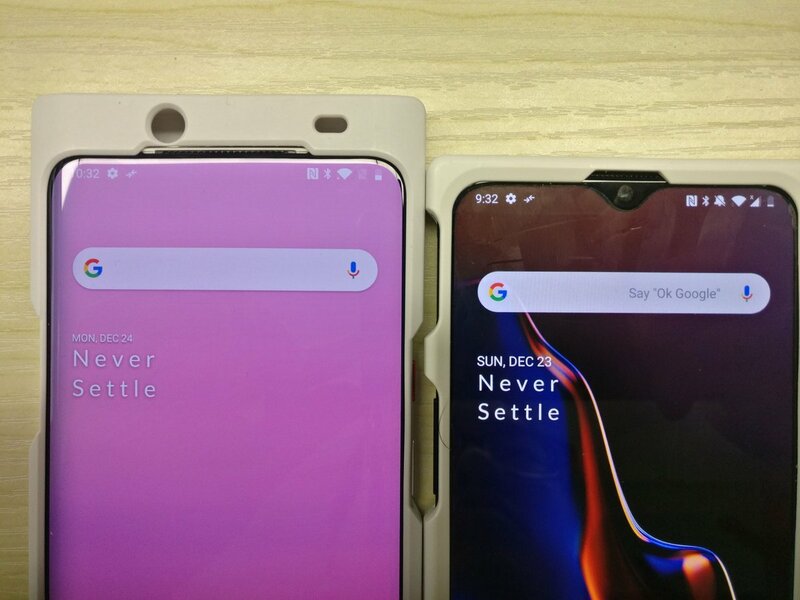 On the other hand, though, there are a few details in the image that do make sense, posing the question if OnePlus is at least prototyping a slider. First, the chunky white cases on the 7 (pictured below, on the left) and already released 6T (below right) are a pretty standard method of concealing phone designs during testing. The hardware and software looks highly authentic right down to OnePlus’ weird NFC logo, though that isn't impossible to fake. Making OnePlus’ traditional alert slider red is also logical, as more phones such as the Huawei Mate 20 are praised by reviewers for adopting boldly colored buttons. Moving it down slightly relative to the OnePlus 6T could come as a fix in light of complaints that it was out of reach. However, it's easy to spot several oddities in the image as well. The date and time, for example, are 25 hours apart between the phones which is odd when you consider they’re both connected to Wi-Fi and able to update their clock. It’s also hard to imagine why the 6T might need a concealment case when it was released two months ago, and it’s strange that it has a large gap above the volume rocker when there’s no buttons nor antennas there. 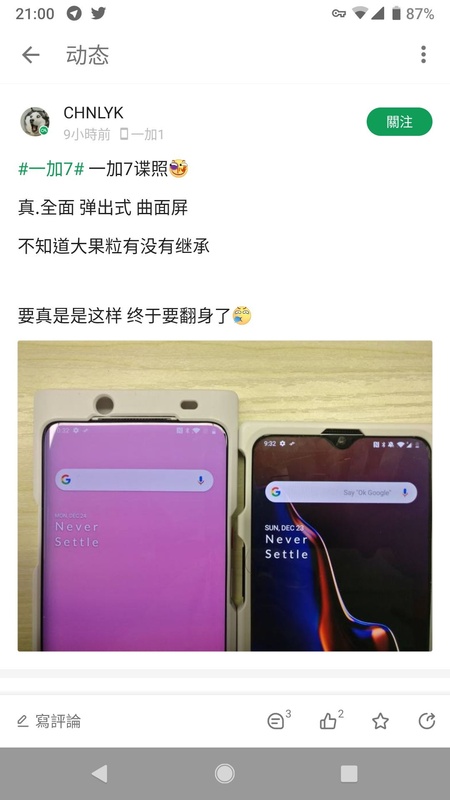 If this is the real OnePlus 7, however, we’re in for a treat. 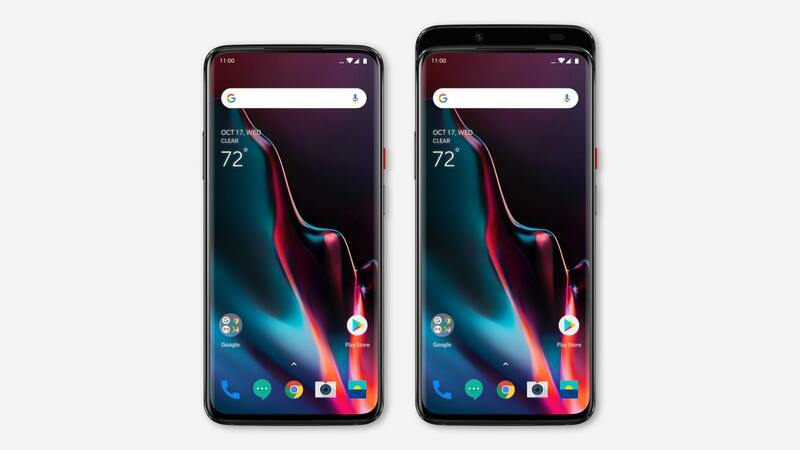 As you can see in the artistic rendering at the top of the page, removing the notch and curving the screen makes it the best-looking OnePlus phone yet, on par with the infamous Oppo Find X. Helping it stand out from the Find X is an enlarged speaker grill, which suggest that OnePlus might be going for a proper stereo effect. Of course, the flagship feature is the slider. As is obvious from the top portion of the case, the device has a retractable module that slides upwards to expose the selfie camera and sensors. However, unlike cases for the Mi Mix 3 which grip onto the back of the phone to let the screen slide, this case seems to grip onto the screen. This indicates that it isn’t the screen that slides down, but rather the back that slides up. This novel approach makes sense for the OnePlus 7: the very delicate in-display scanner isn’t forced to be mobile, the curve of the screen doesn’t get in the way and the large earpiece speaker isn’t muffled. Having the rear slide up also wouldn’t be very challenging to construct; the selfie camera modules are very thin and connect to the motherboard with a single connector ribbon. The screen and in-display fingerprint scanner require substantially larger connectors, and in the case of failure, they’re much more essential than a selfie camera. It is possible that the OnePlus 7 could feature a mechanical motorized sliding mechanism, but that seems unlikely given the poor reception the Oppo Find X and Vivo Nex S received when compared to the Mi Mix 3. OnePlus’ biannual release cycle puts the OnePlus 7 launch around May, so it could be just a few months until we find out what it really looks like. Maybe this is a good arrangement for a user who doesn't lock their phone and rarely uses the front facing camera? For me, the slider would be a huge inconvenience. When I switched to the iPhone X, it was only hours before I stopped seeing the notch and more importantly started being addicted to the instant, automatic unlock via Face ID almost immediately, within hours. Having to open a slider for that to work would be a big step down. Plus, I spend a fair amount of time on FaceTime calls. I'm not sure how balanced / pleasant the phone would feel for extended use with the slider open, but at best it just seems like it would be a taller form factor that if it was good, it could have been that size in the first place with the taller real estate usable all the time. Can you make a hole in display for camera that is covered by display and only opens when you're using the camera? Pretty sure Samsung is already working on that, but it isn't likely to show up in their phones until next year at the earliest. You do realize both devices are in concealment cases right? Meaning a portion of the bezel is covered. Looking forward to a phone that was not desgined by a plumber. Someday soon the phone makers finally figure out the bezelless, holeless, notchless phone. What in the hell will they have to do next to sell new product? Maybe write an actually good UI? Nahhh, 12 years later and still muddling around with clones of the original iPhone OS. At least MS tried something a little different with their failed phones. Ah, yes foldable displays. Yet another answer to a question nobody was asking. Foldable displays are actually a really important technology that many want. It finally answers the question of whether you should buy a tablet/phablet or not. The answers is NO, just buy a foldable smartphone. I would also love to have a bigger screen for movies while traveling without having to carry another tablet with me or use the laptop. I'm sure that early generation examples will have a lot of problems and compromises, but it will get there eventually. In 5 years it will become good enough for most people to buy. Why doesn't someone just sell a phone with no selfie camera? I never use mine and would gladly buy a variant without it if it meant a fullscreen with no gimmicks. the only reason I'd buy a sliding phone is if it had a physical keyboard like the old droids from times long past. Now that's a decent idea but I suspect that a very large number of (younger) people use the selfie camera a whole lot. However, how bad would the product segmentation be if they just modified a decent large screen model with no camera/hole/notch and just go full bezellless. I've used my front camera a very few times, mostly while fixing things that I can't fit my fat head in to see (dryer control panel for instance), but if I really need that front camera I could just grab one of my old phones from a drawer. What about proximity sensor? Funny if people will have to slide the rear up to have the screen automatically turn off when they have a call.